Stop relying on the bees! 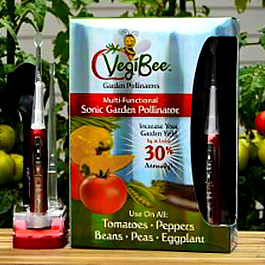 Affordable hand-held sonic garden pollinators increase your garden’s yield by at least 30%. Use on tomatoes, peppers, beans, peas, eggplants, strawberries and more. The sonic garden pollinator extracts and captures pollen into a specifically designed spoon, which is then used to pollinate 4-5 additional flowers on the same vegetable plant.